With a title like Never Knew Another, I imagined life deep in the woods, far from other human beings. It’s amazing what another writer can imagine when looking at a book cover—and how different the actual story turns out to be. 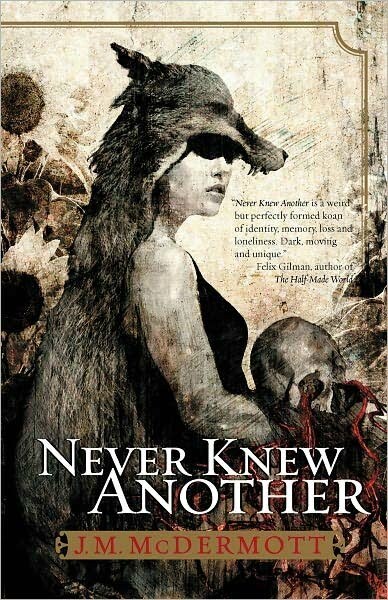 Never Knew Another by J.M. McDermott reads like a noir crime thriller set in inner city Chicago. But this is fantasy, so the plot revolves around people born of demon parentage. With some effort, demon kin can pass for human, which reminded me of the many Twilight knockoffs weighing bookshelves these days. Themes of alienation and prejudice abound, but unlike vampires, there is nothing attractive or romantic about these demon kin. Their blood and sweat burns like acid, wipes out vegetation for years, and sickens people like the black plague. About halfway through the novel’s 240 pages, I almost decided not to review the book. McDermott offers a new depth of meaning to the term dark. Everything in this dark, dank setting revolves around slaughterhouses, sewage, whorehouses, and of course, murder. Things bleed and ooze and drip, and there are so many references to bad odors I have to give the author credit for his attention to the so often ignored sense of smell. The writing style is modern to a fault. Sentences are short and choppy, mostly beginning with subject-verb. On the plus side, you won’t find any passive voice here. The book is narrated by two characters we learn nothing about. Even their names are withheld, as they are referred to only as “I” and “my husband” throughout. I and my husband are either wolves than turn into humans, or humans that turn into wolves. The story never makes it clear. They are also clerics, in a very Dungeons & Dragons way, so they have the power of clairvoyance. By touching the body of another creature, even a dead skull, they absorb its memories. McDermott uses this technique to great effect. As the wolf people search the memories of a dead demon-spawn named Jona, Jona’s story gradually unfolds. Most of the book focuses on Jona, as the wolf priests search his memories for other demon-kin he may have known. Despite having acid blood and an inclination toward violence, Jona comes across as a sympathetic protagonist, at first. He is a loner alienated by his heritage, who doesn’t want to be evil. He wanders the city, terrified of being burned for what he is, and the story wanders with him, like a demonic version of Catcher in the Rye. The problem is that—despite sympathizing with his situation, Jona comes across as a horrible person. Perhaps McDermott was trying to say something about how a person’s inner nature is inescapable, but it’s hard to care about a guy who murders indiscriminately on a nightly basis. I almost gave up reading then, but a little further on, the another comes to town, Rachel, who suffers from the same malady of birth. Seventy percent into the novel (according to my Kindle) and Never Knew Another finds its focus in a love story. McDermott here does an excellent job of grounding these characters in reality. I found myself genuinely caring about Jona and Rachel, and I eagerly anticipated a great deal of drama between them. Unfortunately, the author seems to have run out of paper, because the book simply stops (a frustrating trend these days). Nothing is resolved, except for a mystery of minor importance. Overall, I applaud McDermott’s efforts for writing something that takes the fantasy genre into new territory. I was also impressed by the level of emotion, the sense of alienation and fear you end up sharing with these demonic characters. I almost feel that Never Knew Another was a missed opportunity. The plight of individuals born to demon parents might have made an interesting commentary on social prejudices. After all, non-demon humans inflict much more pain and suffering. On the other hand, Jona is no Frankenstein. Sympathizing with demons in McDermott’s world is like having pity for the Ebola virus. By the end of the book, it’s hard not to come to the same conclusion as the narrator, that it’d be better to destroy them all, despite any redeeming values. But then again, maybe that was the author’s point all along. McDermott does not offer easy answers. He challenges the reader to evaluate his or her own conceptions of good and evil, and in fiction that is always a good thing.